This looks a lot like a previous "Rebuilt Log Cabin" I posted, but it's yet another quilt -- the colors are probably similar. If you have studied this design, you may notice that I did the same cutting of border corners as I did with the block - look what happens? Hey, cutting off those 4 corners took courage! I have a Tutorial -- my one and only Tutorial (tab across the top) for a Rebuilt Log Cabin block. 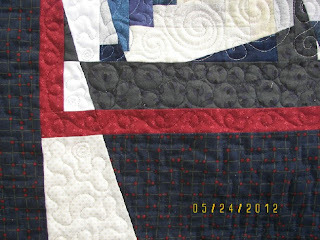 It's quilted with a variety of patterns and threads requiring several different needles and a LOT of tension adjustments. I'm happy with it, and LOVE the border variation, and really love that I took a chance! Quilt size is about 65" x 85". I quilt on a DSM, a Janome 6500. 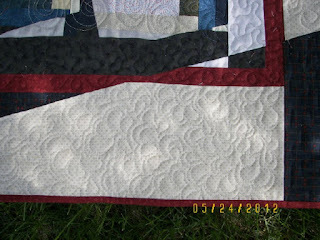 I started quilting Sunday, and finished it today, Thursday. I like the way the borders look. And I am sure it took a lot of courage to cut them off. That's a really stunning border treatment. Love how you mix it up with the quilting. It's like a Patsy Thompson/Pajama Quilter sampler! The pebbles look amazing. I might try some. What a great border idea. 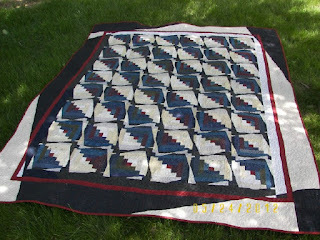 And a stunning quilt. Very, very, very nice borders! Absolutely stunning! I LOVE your tutorial!!! Oooh, I like this too. It gives me a few ideas for some of the tops in my UFO pile! Thank you! Your twisted log cabin is great. And your quilting is outstanding. Wasn't it scary...and fun...taking a chance? Wow, love the way the border looks. I am sure it took lots of courage to whack them off. Well, aren't you just so smart.....That turned out amazing....Good job!!! Love that visual "tilt"! You ALWAYS do such a lovely job quilting. You are truly an inspiration. This quilt looks great! The quilting is beautiful. I love your border, it extends the feeling of the blocks out to the edges. Very inspiring, thanks! Oh you enabler you! Love the most recent scrappy rebuilt log cabin. And, yes it looks very much like the previous color-wise. But, my oh my! That border is fabulous. You are one creative lady. I'm looking forward to getting back to work on my log cabins... oh, eventually.... things are a bit busy in the household now! Your borders are so cool! OMGoodness... you done great! Love the borders. So inventive. Good for you. I will definitely read your tute on how you did this. Great job!!! Love this quilt. Thanks for sharing. Ooh. 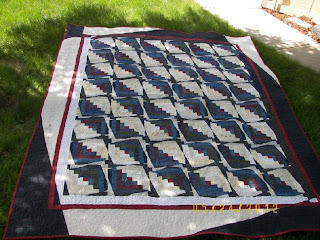 Beautiful quilt, and a great border! I BET that took courage to cut the corners off!